Dichroic and Resin necklace. I hand make every one so I can guarantee each one is unique. 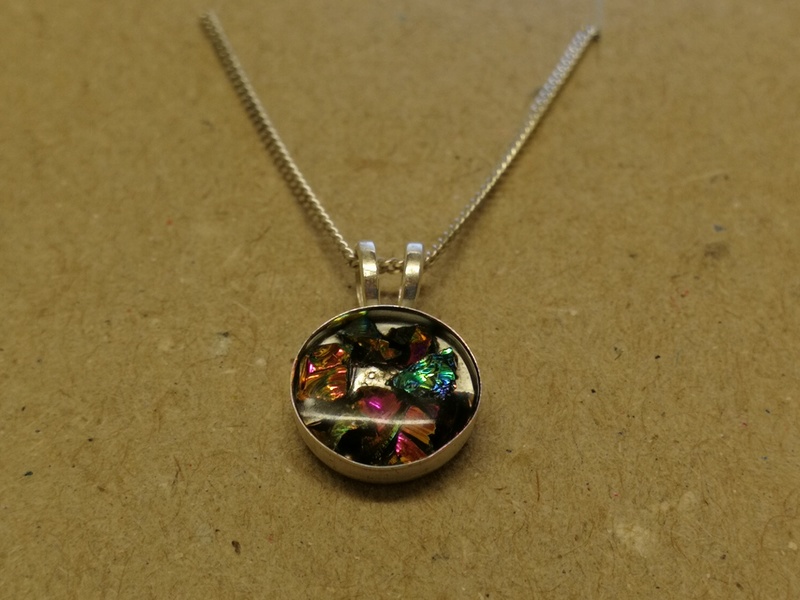 Ordering a dichroic and resin set pendant. – select a plain base colour glass and I will use that as the predominant colour adding dichroic for sparkle. Eg. If you select blue I will add plain blue pieces and select dichroic that has a blue shine. (you will get other colours in the pendant, but they won’t dominate) . 4) you can have ashes/hair, puppy/baby teeth added. You can choose if you’d like the ashes visible under a clear layer of resin, or hidden within the colours glass. This is your jewellery and it should be your way. 5) Select heart tag/s if you’d like one or more added. I use a 10mm heart however if you require more than 3 characters stamped, please select the LARGE heart. I will contact you to discuss your requirements. 6) Decide what you’d like the tag to say as it is handstamped by me. Perhaps you’d like initials, a name, date, Dad, Mum, Nan or a paw print? It’s your choice.. Upon ordering a memorial Necklace, I will send you an envelope containing everything you’ll need to send the ashes, hair, teeth or other item to me. I will require a very small amount per necklace and any unused ashes etc will be returned to you. Due to the nature of phone and screen colours may differ, therefore, if you select plain glass colour to be included, I will send a sample of the glass colour you have chosen. Please return it with the ashes as this will enable me to make the perfect piece of jewellery for you. 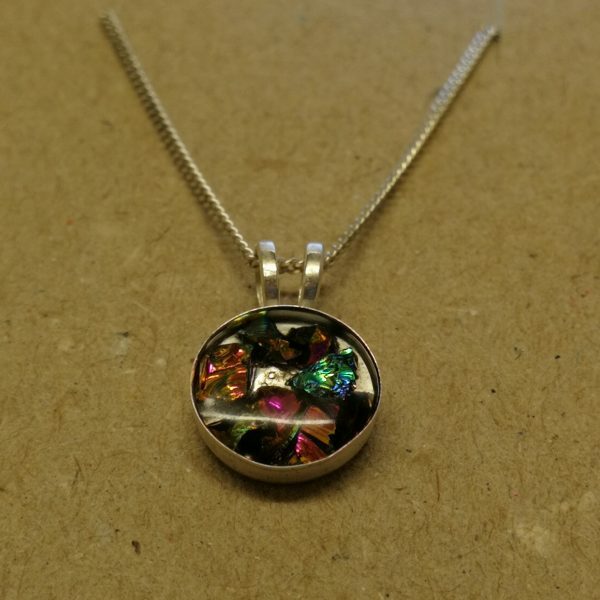 Your beautiful memorial necklace will come on a your choice of chain in a gift box. Please allow 4 weeks from the date I receive the ashes for your jewellery to be handmade. As a glass artist with 15 years experience, I predominantly work with glass. However, I am making these dichroic glass and resin necklaces for 2 reasons. 1) I have created Memorial jewellery encapsulating ashes for many years. I have often been asked if I can set hair and even puppy/baby first teeth. As these would be damaged in the process of glass fusing, resin is the option I am using. 2 ) Dichroic glass is glass which displays two different colors by undergoing a colour change in certain lighting conditions. As an example a blue glass will have green in it. When it goes into the kiln its blue. When it comes out its green but in the light you’ll see both colours. Using the dichroic in its unfired from, I can select the glass and this won’t change. So if I select a bright pink piece you will see other colours but the pink will dominate. – Ashes of both pets and loved ones. – if you have other ideas or requests please message me. Many of us have lost someone close to us and I appreciate how difficult it is when they are no longer by your side. Whether it is a loved one or a beloved pet you have lost, I can hand make a lasting piece of jewellery for you. What sets me part from others? With over 15 years experience of encapsulating cremation ashes in glass, my work is of exception quality. I am a small business which allows me to really listen to you, your ideas and gather information about what your design should mean to you. My customer service is personal, friendly and I am invested in ensuring you recieve a piece of jewellery you’ll love. I will treat your loved ones, or pets ashes with respect. I am extremely passionate about creating these very personal pieces of jewellery and I am able to involve you in the design process. You’ll be able to choose from a wide range of glass colours, both plain and dhichroc, to be place in the resin. Many aren’t offered by others. I can create jewellery from random dichroic pieces or taking your colour choice into account I can select each piece of glass by hand. I also hand select individual pieces of ash to place into the resin thus creating a truly unique and beautiful piece of jewellery for you. Memorial jewellery. You will have 72 hours after we have agreed on a design to make changes. Refunds. No refund are offered on memorial/personalised jewellery unless an error has been made by me. Items In stock will be shipped within 1-3 working days 1st class signed for. Items made to order will be shipped within the agreed timescale notified at the time of order agreement. 14 day returns policy. Buyer is responsible for returning the item in the original. Condition, packaging and the cost of the return postage. Made to order items may be refunded if agreed by the seller. No refunds will be offered on personalised items unless an error has been made by the seller. Made to order items will be confirmed via email and a cut off date for changes will be agreed upon.